None of us really into organized trips – they are simple, organized, compact, no chance to replan: zero challenge. 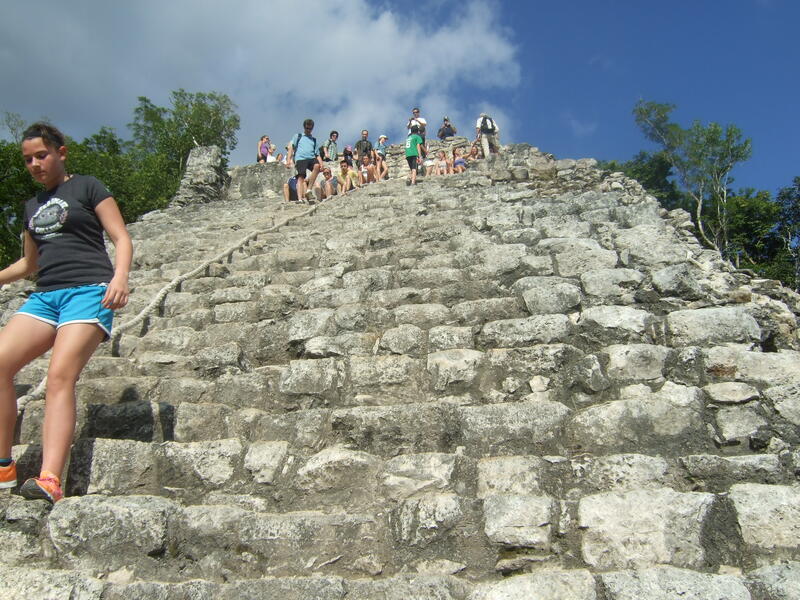 However we’ve get tricked into these options every now and then, for example when we booked into Alltournative’s Coba Mayan adventure. The good thing about this company is that at least they try to be a bit different. All of their tours run on the concept that before visiting a lesser known Mayan site or ruin, you would get to know some part of the Mayan culture or ways of their living which is still leaves a vivid pattern on the Yucatán peninsula. Just like any other tourist organization, this company aims for American tourists as well, so the concept of “fun” and “encounter” is different from what a European, less commercial tourist would expect. Cenotes are sinkholes, created by mother nature in corporation with the Yucatàn’s limestone based structure. These sinkholes were the center of communities for Mayas. Where there is a cenote, there is/was a Mayan village around, as these sinkholes provided clear drinking water for the inhabitants. This particular cenote itself looked like a crystal clear lake topped by an enormous limestone dome, (kudos mother nature, you did it again). It’s peaceful, it’s quiet (even the loud fellow tourist got silent for a wee bit), it’s pure, it’s fun. After a great lunch (never ate such a delicious black bean meal), we head down to Cobá, which seemed to me like a hidden treasure. When visiting the Yucatán, the first Mayan site that gets promoted is Chichén Itza: it’s big, it’s famous, it’s a World Heritage site. 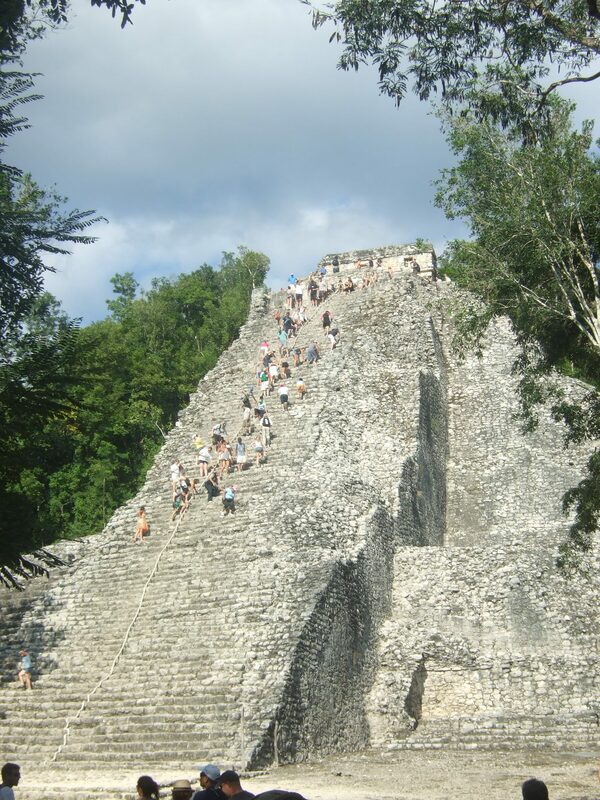 However, before the rise of Chichén Itza, Cobá was the political and cultural capital of the Mayan. The town itself was bigger (in size) than Chichén Itza, however, the lush vegetation and the earlier fall helped hiding this wonder. As our guide told us, currently, only 6% of Cobá is an open site for tourism; the rest of the town is hidden (or eaten up) by the jungle that surrounds the site. Side note: the complete territory of Chichén Itza’s archeological site is the same size as the visiting site of Cobá 6%, which leaves Cobá a 94% bigger town than Chichén Itza. 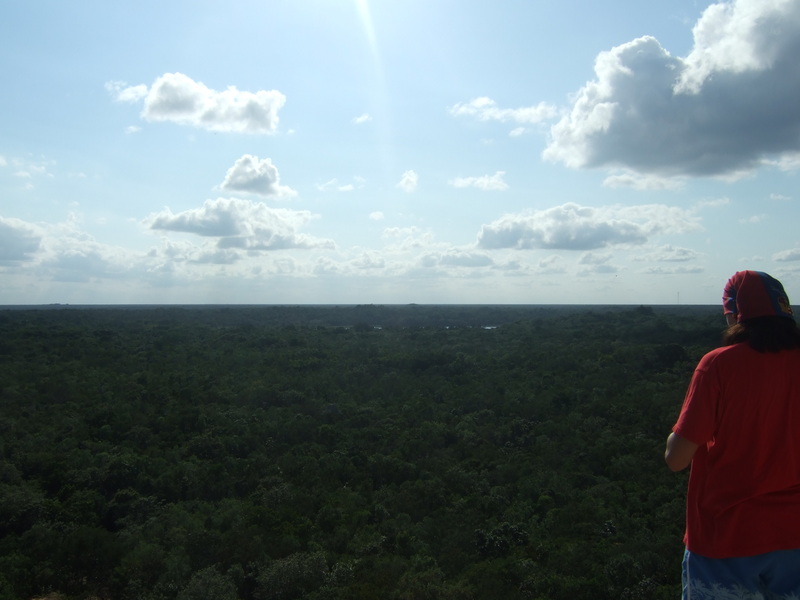 Apart from the “which town is the more awesome Maya site” (which our Mayan guide was fascinated about), one thing is definitely more awesome at Cobá, and that’s the 42 meter tall grand pyramid, Nohoch Mul. The thing is that National Institute of Anthropology and History (INAH – it runs almost all the Mayan historical sites in Mexico), partly due to conservation purposes, partly because of lethal accidents, shut down most of the climbing activities at these ruins. You can walk around, take tons of pictures, eventually touch the ruins, but you cannot climb anywhere up. Not sure how long this restriction can keep Cobá open for the climbers, but if you have somewhere a check list item called “climb a Mayan pyramid”, make sure to head towards Cobá. There is something indescribable about the feeling when you reach a top of a 42 meter high building, erected more than a 1000 years ago, being all sweaty and dizzy, you watch every step not to fall down, and when you recollect your guts and breath and look around you realize that you reached over the top of the mighty jungle. I’ve never been to Mexico, but would love to visit these sites, spend hours wondering around this luscious jungle and maybe climb one pyramid (of the few available, right?). I think I guessed who is afraid of heights in that picture above… Hehe, bikini in the jungle… Only place I’ve done it is Brazil, of course. Where are the other adventures in mexico? More posts to come? Did Daniel enjoy the trip? Hehhe, never thought of it, but now that you mention 🙂 There is something with climbing I like. It’s like yoga, you have to be there both mind and body at the same time – focused and balanced. Regarding black bean meal, I’m ready to be part of a comparative study and try your black bean meal 🙂 Let me know when and where. I planned to shoot some more posts about the trip, but you know, time is not always on me side 🙂 But I will try to keep them coming!